Florence Kiplagat clocked 65:09 at the eDreams Mitja Marató de Barcelona on Sunday to improve her own world half marathon record – set at the same event 12 months ago – by three seconds. 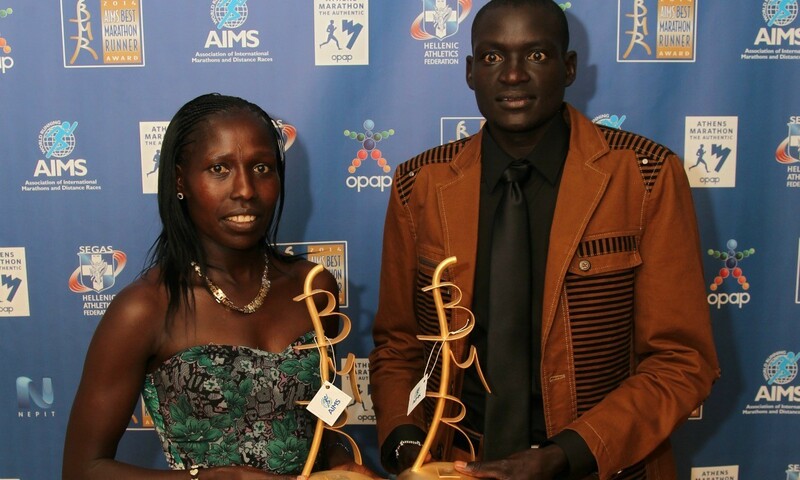 Last year Kenya’s 2010 World Half Marathon Championships gold medallist, pictured above with men’s marathon world record-holder Dennis Kimetto after the pair received their AIMS Best Marathon Runner awards in 2014, had run 65:12 to shave 38 seconds off the previous world record of 65:50 set by her compatriot Mary Keitany at the 2011 RAK Half Marathon. On Sunday, paced by Marc Roig and Ezekiel Kipchirchir, she crossed the line three seconds faster to finish 12th overall, with Tadesse Abraham winning the men’s race with 60:42. Ireland’s Elizabeth Lee was the second female to finish, clocking 74:06. Having gone through 10km in 31:01, compared to 31:08 12 months ago, Kiplagat went on to clock 61:54 for 20km to also better the world record mark for that distance of 61:56 she set in Barcelona last year.